Adolescent girls face more hurdles to healthy, safe development than ever before, and with greater-than-ever risks. Taking on the responsibility of helping them is unarguably challenging and frightening. However, as reflected in Dr. Strauss's final chapter, Ten Reasons for Hope, we are in the midst of important changes in how we understand girls, adolescence, the life course, and the impact of culture. 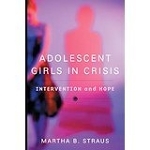 In this highly practical and compassionate book, Dr. Strauss guides us toward understanding this and how details how we can make effective and lasting changed in the lives of our teen-age girls.